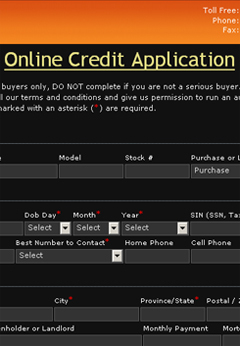 For your dealers we provide unlimited credit links, capture credit applications, complete telephone verifications, gather vehicle and pricing details, capture and record credit card authorizations for deposits/downpayments (if applicable) then forward to your brokerage for processing via fax, email or website plus. Price: $45 per month, per dealer. You can now take advantage of your dealers online exposure you can use this service to place links on each of your dealers online media advertising, when visitors apply for car loans it all comes to your brokerage for processing. Approve your dealers customers before they get to the dealership, build loyalty and secure the client even if they decide to shop at another dealer, you may even want to bill your dealer for the already approved client that you referred. We are happy to announce that you may now sign up for your own merchant account to process customer credit cards for your business through our special partnership with Pivotal Payments. To ensure you receive the best possible pricing , we have pre-negotiated preferred rates for all of our clients. In addition, Merchants with volumes of $50K + per month, will receive a free iPad Mini — a value worth over $300.00! Accepting credit cards has never been easier and more affordable.